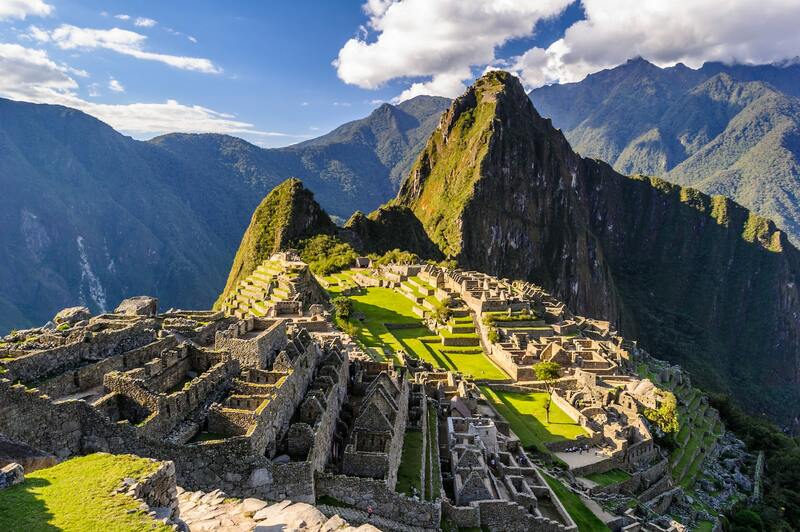 Journey from Peru’s Sacred Valley of the Incas to the ancient mountaintop city of Machu Picchu. 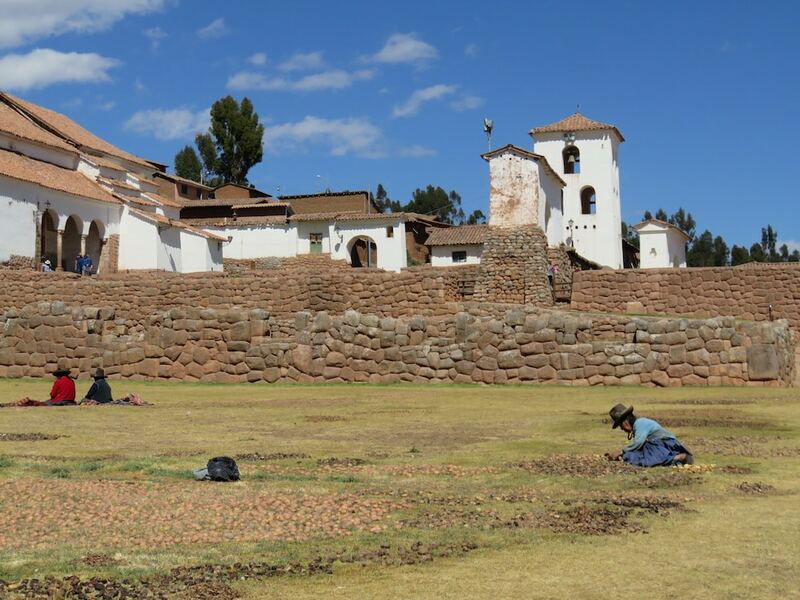 Explore the rich Inca and Spanish colonial past in historic Cuzco. 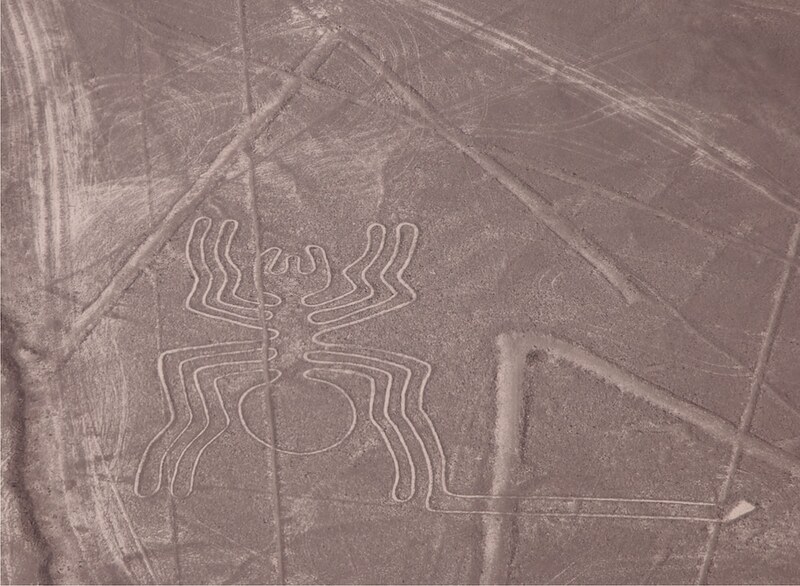 Enjoy an optional excursion to see the famed Nazca Lines from the air. 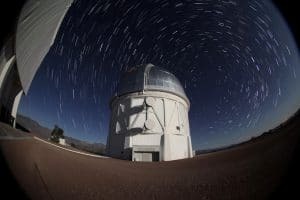 And as the centerpiece of your adventure, travel to our special viewing site in the foothills of the Andes – close to four of the world’s largest telescopes – to stand for 2 minutes and 15 seconds in the shadow of the Moon. TravelQuest invites you to join us in the summer of 2019 for a once-in-a-lifetime South American odyssey with a dramatic focal point: the total eclipse of the Sun on July 2. Our itinerary weaves together two dimensions of this fascinating continent: spectacular landscapes with unmatched views – to the horizons and skyward – in remote areas of Chile and Peru; and a legacy of engineering, architecture, art and philosophy that includes a tradition of astronomical observation dating back two millennia. Our 11-day adventure takes you from the streets of cosmopolitan Lima to the archaeological gem Cuzco, onetime capital of the Inca Empire – and on to other remarkable monuments and ruins among the Andean peaks, ending on the emerald terraces of the so-called Lost City of Machu Picchu. 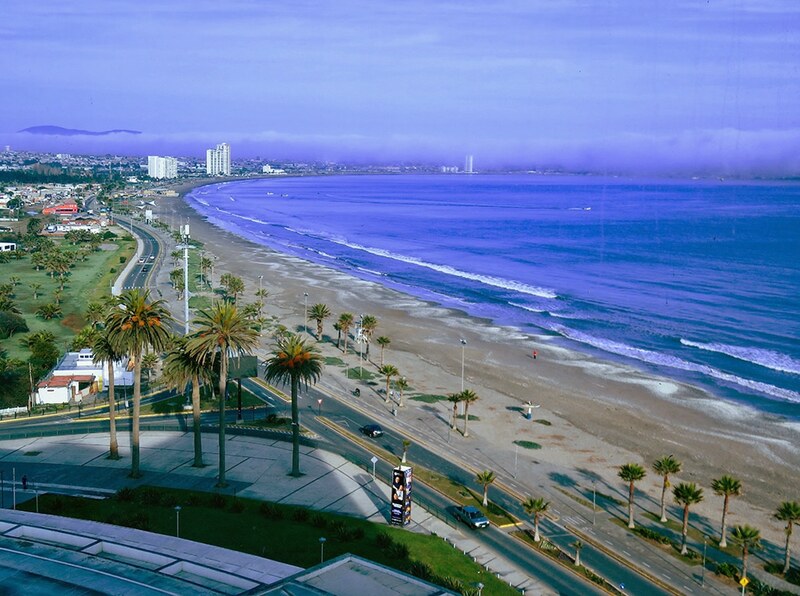 We then fly south to the seaside city of La Serena, Chile, enjoying its beaches before heading inland to experience the eclipse. 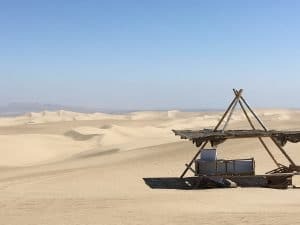 And as a preamble to this unforgettable trip, you can opt to fly over Peru’s arid southern coast to see the stunning Nazca Lines from the vantage point of the gods. 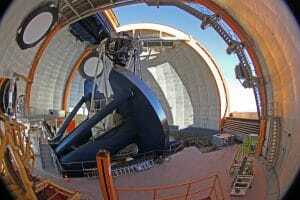 The fact that TravelQuest’s eclipse-viewing site is close to four of the world’s largest telescopes – Cerro Tololo, La Silla, Gemini South and Las Campanas – tells you we’re likely to encounter minimal cloud cover, even though the 2019 eclipse falls in the middle of the Southern Hemisphere’s winter. We’ve selected a site that’s tucked into a protected valley in the Andean foothills. It’s far enough inland to escape any coastal cloudiness that might occur on the big day, and deep enough in the mountains to erode any passing clouds from larger-scale weather systems. Satellite measurements show an average daytime cloudiness of just 35% in July, making our site one of the best in the region. Based on past weather statistics, we know that 25 days of the month are liable to be either sunny or partly cloudy, with most of those clouds in the morning hours, well before the arrival of the lunar shadow. 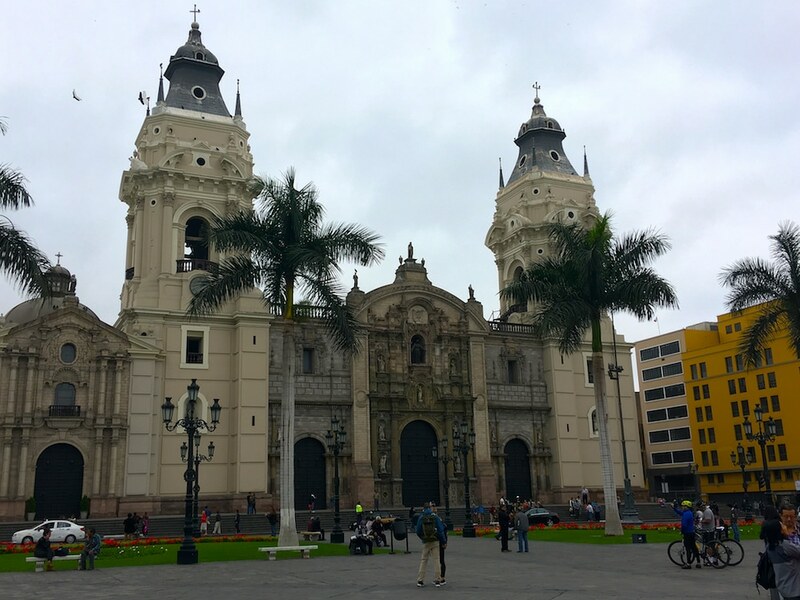 Arriving in Lima on the Pacific coast (airport code: LIM), you’re met by our TravelQuest representative, who arranges the easy transfer to your hotel. 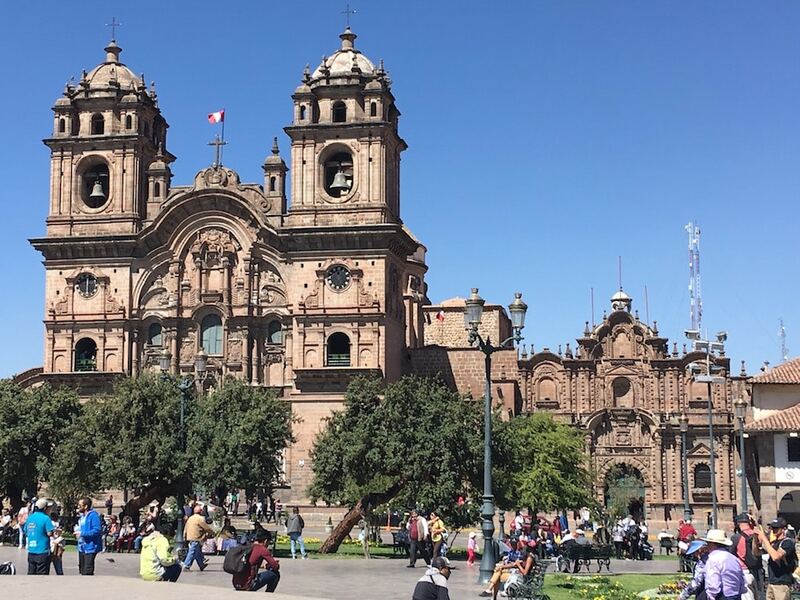 For the balance of the day, relax and explore Peru’s fascinating capital on your own. 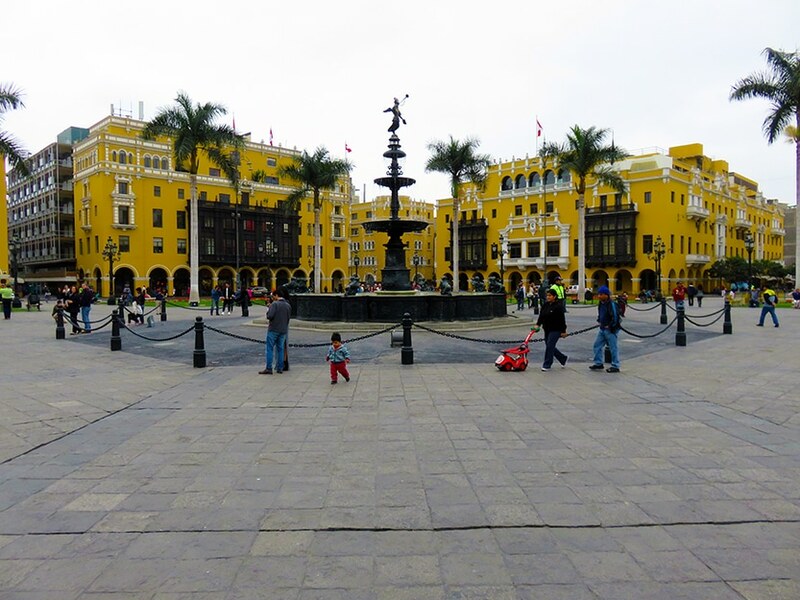 Your expert-guided tour of Lima begins in the city’s historic central square, which is ringed by the Archbishop’s Palace, Government Palace, City Hall and the imposing Basilica Cathedral. 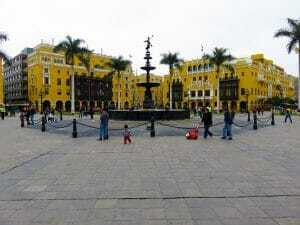 Founded by Francisco Pizarro in 1535, Lima was the center of Spanish rule in South America for three centuries. Today its colonial heart is rightly protected as a UNESCO World Heritage Site. Your tour also includes a visit to the Convent of Santo Domingo, renowned for its beautiful cloisters and various relics of Santa Rose and San Martin de Porres, Peru’s two most important saints. Our midday break is at a beautiful hacienda, where you enjoy a delicious lunch on the grounds – your first chance to sample Peru’s justly renowned cuisine. And in the afternoon, experience a classic horse show featuring the Peruvian Paso, whose exceptionally smooth gait the show’s trainers have tuned to perfection – to the point where the horses also take part in a traditional Peruvian dance. After an early breakfast, we’re off to Lima Airport for the 1.5-hour flight to Cuzco, ancient capital of the Inca Empire. 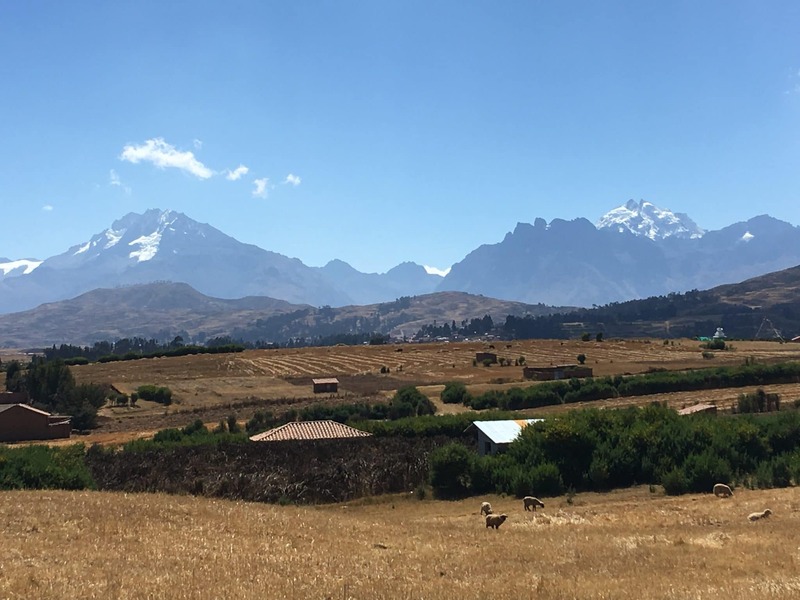 From there we travel northward, deeper into the Andes, with a stop at the market town of Chinchero to shop for textiles and local crafts while taking in the stunning foothills scenery. After lunch, we carry on to Urubamba in the Sacred Valley of the Incas. At 2,870 m (9,420 ft) above sea level, it’s lower than Cuzco and is considered a good place for acclimatizing to the region’s high altitude. After an early breakfast, get ready to experience Machu Picchu, the legendary Inca city in the sky. We’re keeping our hotel rooms here in the Sacred Valley, so you only need to bring a small travel bag for your overnight stay. At nearby Ollantaytambo, board our first-class Vistadome train to travel from the Sacred Valley up into the cloud forest, enjoying unmatched views of the peaks through from the glass-ceilinged cars. Your 1.5-hour journey ends at Aguas Calientes, at the foot of Machu Picchu, where we arrive in time for lunch at a typical Andes restaurant. 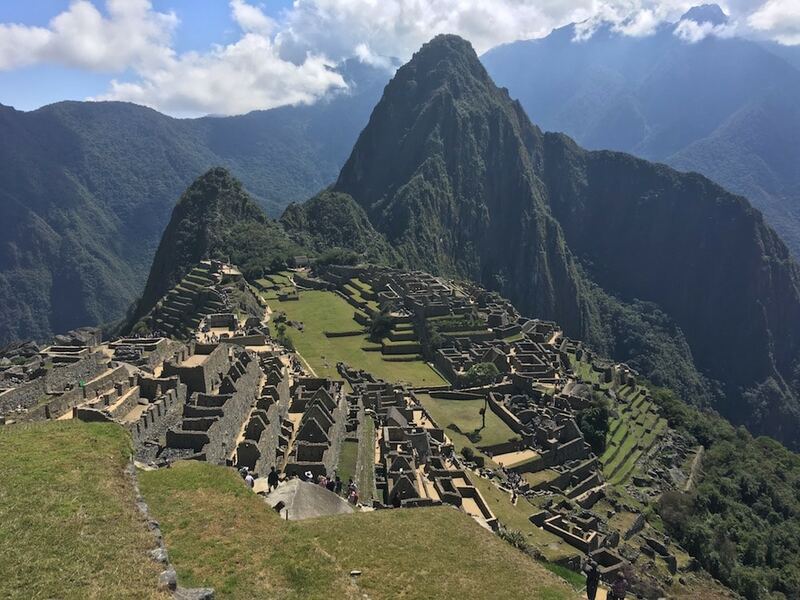 We’ve timed our tour of Machu Picchu for later in the afternoon, as many visitors arrive earlier in the day and will already have headed back down the mountain – creating a more enjoyable experience for us. After lunch, a shuttle whisks you up the mountain to the site entrance, where our expert guide is waiting to show you this magnificent Inca city that remained hidden from outsiders for so long. Seeing and photographing firsthand the expansive stone ruins, steep terraces and looming cliffs, it’s easy to understand why Machu Picchu is regularly ranked among the wonders of human design: the stonework is so well engineered that many walls remain almost perfectly intact after more than five centuries. Following this initial experience of Machu Picchu, we return to Aguas Calientes and our comfortable hotel. 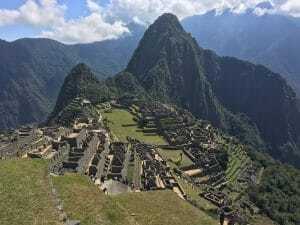 If you’re up for joining us early, ahead of the tourist swell, we offer a second opportunity to explore Machu Picchu – this time in the morning light. Our guide will meet you in the hotel lobby and lead you on a fascinating tour exploring other dimensions of the ancient site. Or if you prefer, you can spend the morning at your leisure, exploring the local craft market or visiting Aguas Calientes’ hot springs. 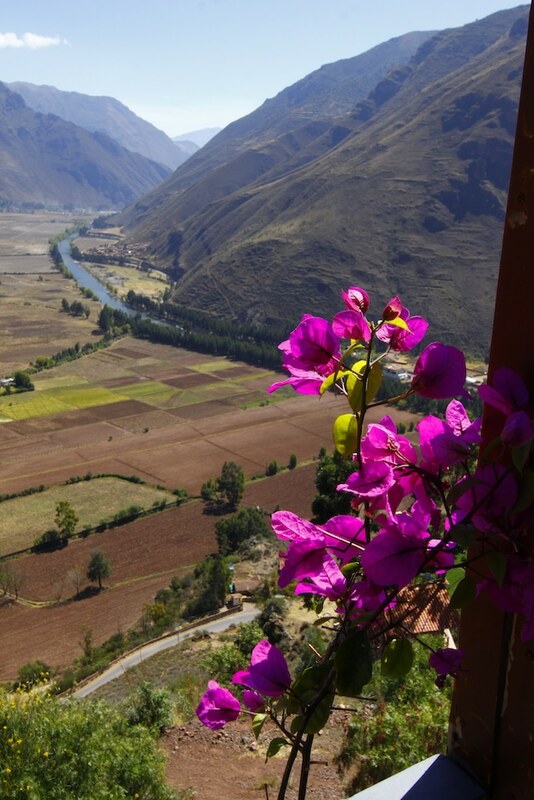 In the afternoon, enjoy more breathtaking views on the return train ride to Ollantaytambo, concluding another great day back in your room at our Sacred Valley hotel. After breakfast at the hotel, we depart in the late morning for Cuzco, passing through the archaeological center of Pisac and enjoying lunch at a restaurant with wonderful views of the Sacred Valley. Continuing our journey, we stop at the magnificent Inca citadel of Sacsayhuaman, with walls built from massive stones. It’s an awe-inspiring feat of construction – and the outlooks offer superb views of our final destination. Arriving at Cuzco in late afternoon, you’re free to enjoy dinner and an evening of exploring on your own. Following breakfast, you only need to step outside the door of our hotel to discover the historical and cultural legacy of Cuzco – or Q`osqo, “The Navel of the World,” in the Quechua language. 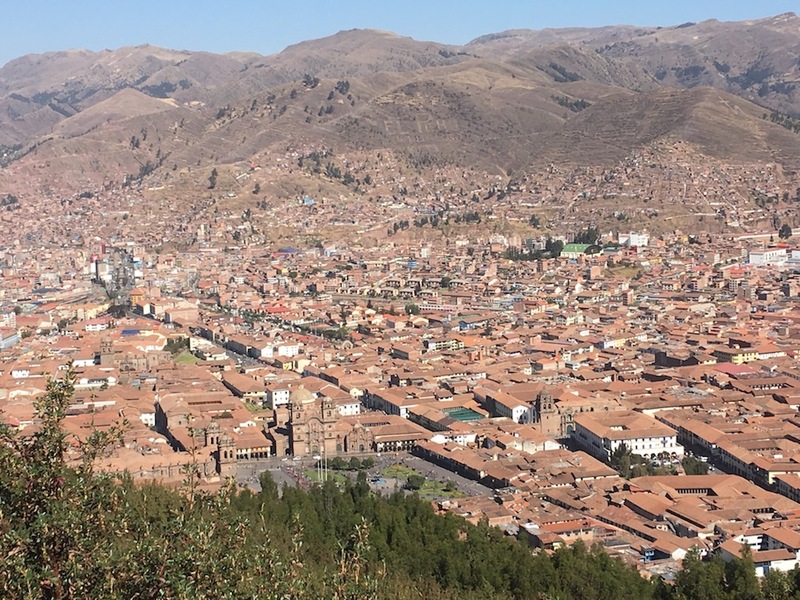 As the capital of the Inca Empire from the 13th through the 15th centuries, Cuzco was renowned for its palaces, temples and other stone structures. Unfortunately, during the Spanish conquest many of these gems were destroyed and their foundations used for many of the public buildings and churches we see today – themselves monuments to another bygone age. This dual legacy of Inca and colonial architecture made Cuzco an obvious choice to be designated a UNESCO World Heritage site. Highlights of your morning walking tour include Korikancha, the Incas’ Temple of the Sun and later the site of Santo Domingo Convent, as well as the impressive cathedral overlooking Plaza de Armas in the heart of the city. 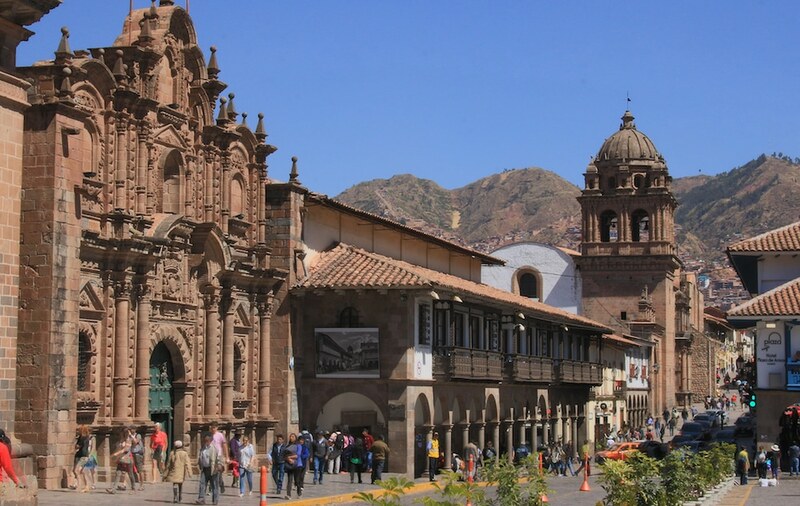 In the afternoon, stroll the streets of Cuzco at your leisure to shop for interesting keepsakes, sample regional cuisine at one of the many excellent restaurants and just absorb centuries of history in this magnificent city among the peaks. After breakfast we head to Cuzco Airport for our flight to La Serena, Chile. As you take in this coastal city’s inviting beaches and distinctive mix of colonial and modern architecture, you’ll immediately understand why it’s one Chile’s most popular summer destinations. This morning we discover La Serena, one of Chile’s oldest cities, strolling with our local expert through its well-preserved central precinct. Set on a bay edged with sandy beaches, the city is known for its pleasant weather – even when we’re visiting at the height of winter in the Southern Hemisphere. After a stroll among colonial-style buildings, we visit La Recova, the town’s main market, where you’ll find a diverse array of handicrafts and other uniquely Chilean products. After lunch we carry on to the scenic campus of the University of La Serena, which has splendid panoramic views of the city. At the end of another full day, join your TravelQuest astronomer for an informative discussion of photography techniques, eclipse safety and the latest weather updates for tomorrow’s big event. Enjoy breakfast at our hotel and then transfer to La Serena airport (code: LSC) for your journey onward. 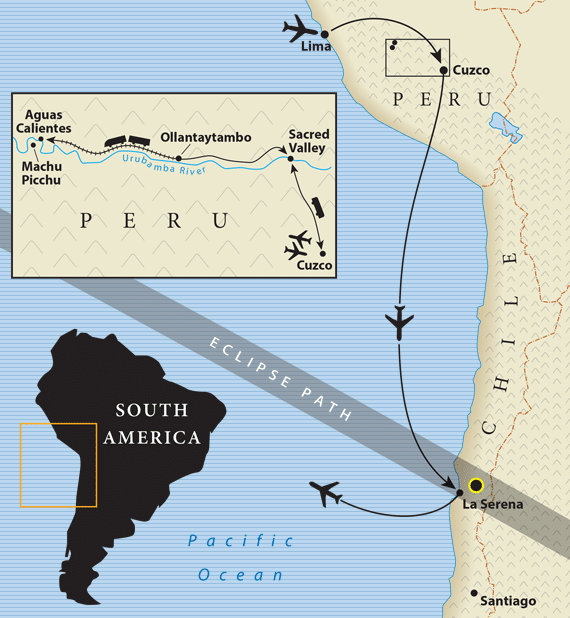 If you’d prefer to arrive in Lima a night or two ahead of our eclipse tour, TravelQuest is reserving a limited number of standard rooms at the DoubleTree El Pardo or similar. Cost: $155 USD per person, per night double occupancy; $300 USD per person, per night single occupancy. Rates include airport-hotel arrival transfer at LIM, as well as daily breakfast and taxes. When you land in Lima (airport code: LIM), your TravelQuest representative is on hand to arrange the easy transfer to your hotel. For the balance of the day you’re free to relax and explore Peru’s intriguing capital on your own. Setting off in the morning aboard our private coach, you can look forward to our first stop at Pachacamac, a vast archeological site in the Lurin River Valley. First settled nearly 2,000 year ago, this ancient pilgrimage center was dedicated to the god Pachacamac – worshipped by several early Andean peoples as the creator of the universe. 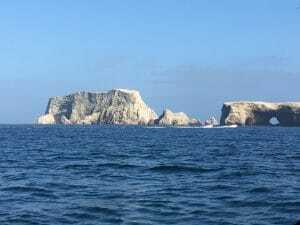 After lunch at a local restaurant, we continue our journey southward along the Pacific coast, crossing the Peruvian desert to arrive at the beautiful Bay of Paracas. 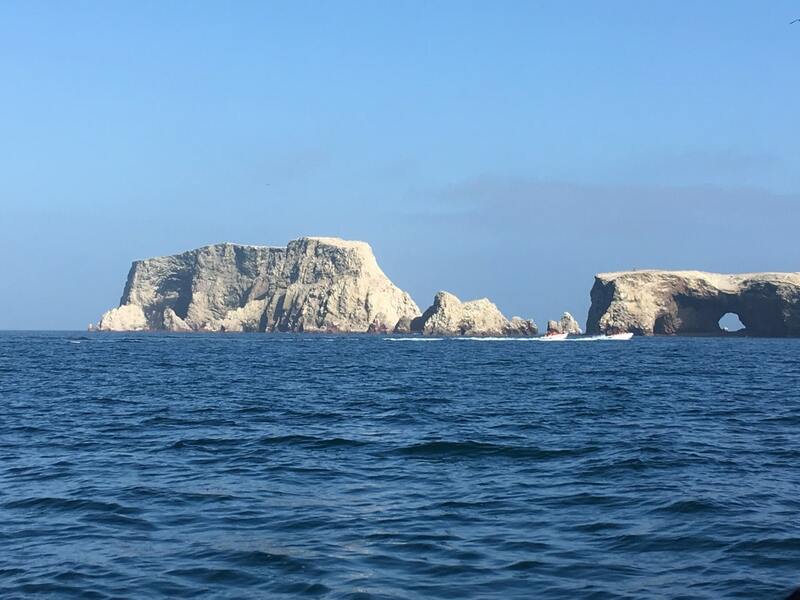 After breakfast, enjoy a brief scenic journey from Paracas to nearby Ica airport, where you’ll embark– weather permitting – on your unforgettable flight over the Nazca Lines. Etched into the desert floor thousands of years ago, the lines remain visible thanks to the region’s exceptionally dry climate. Many theories have been suggested to explain their meaning and purpose, but so far there’s no firm scientific consensus. 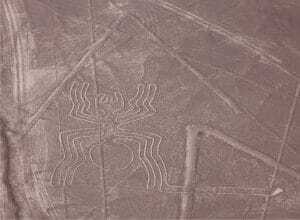 One thing is certain: the Nazca Lines are a spectacular human achievement that can only be truly appreciated from the air. The highlight of your nearly two-hour flight is a 20-minute flyover of a dozen massive images, including the monkey, the spider, the hummingbird and the astronaut. It’s a unique opportunity to try unraveling their mystery for yourself. After this unforgettable aerial tour, return to our hotel for lunch, followed by free time to enjoy the seaside resort at your leisure. 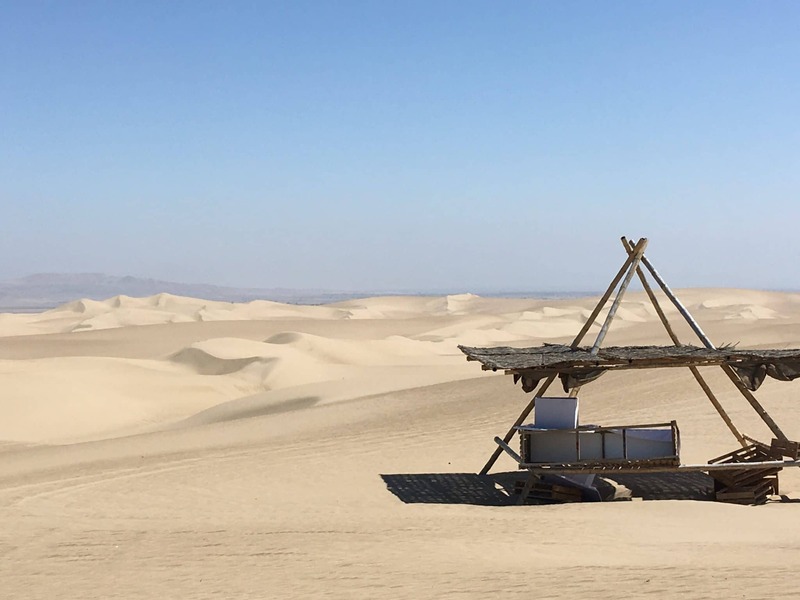 Late in the afternoon, join us for an exciting dune buggy ride among the dunes of Paracas to raise our glasses to the setting sun before we return to our hotel for dinner. After lunch back at our hotel head back to Lima to begin your eclipse tour. $1810 USD per person, based on two people sharing a room. $2310 USD per person for single occupancy. IMPORTANT: Flight price is based upon a passenger weight of no more than 100 kg (220 lbs.). Passengers weighing above 100 kg may incur an additional price supplement. Contact TravelQuest with questions. 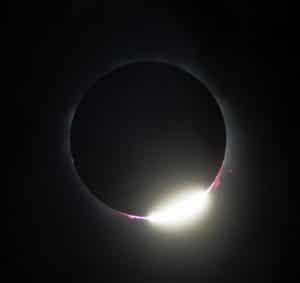 Payment is due at the time of the final payment for your eclipse tour. Once payment is received by TravelQuest it becomes fully non-refundable. 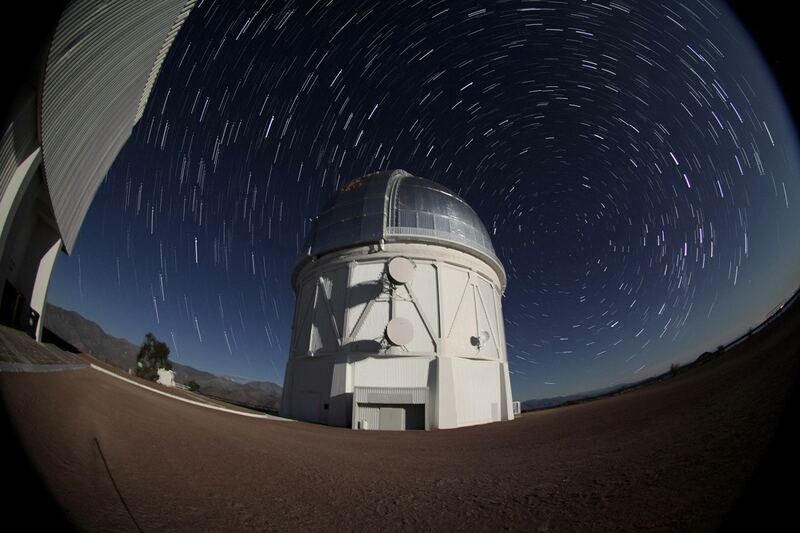 Join TQ in La Serena, Chile for a special post-eclipse trip visit to one of South America’s most significant professional observatories – Cerro Tololo Interamerican Observatory, located 80 km east of La Serena, Chile, at an altitude of 2200 meters (7200 ft.). Cerro Tololo’s complex of telescopes, including the principal 4 meter Victor Blanco Telescope credited with the initial discovery of a portion of Jupiter’s retrograde moons, and other specialized instruments are among the most advanced apparatuses for astronomical research on the earth’s surface today. Level 2 – Easy/moderate: short to medium walks over uneven hilly terrain under easygoing to rugged travel conditions, with varying elevations up to 3,400 m (11,150 ft). At TravelQuest we want to be sure you find the trip that best suits your interests and level of fitness. Please email or call if you have any questions regarding the itinerary. Flights from Lima-Cuzco, Peru on June 25, and Cuzco-La Serena, Chile on June 30 are not included in this tour cost.The additional charges for these flights will be added to your invoice in 2018. All tour prices, taxes and airfares quoted in this brochure are based on tariffs, costs and United States dollar exchange rates that were in effect at the time of publication. Consequently, prices herein are subject to change. Due to fluctuations in global oil prices, a fuel surcharge may be added to your tour fee. You will be advised of details and costs prior to departure. If you’re traveling solo, you can realize significant savings by taking advantage of TravelQuest’s Room Sharing Program, which matches travelers of the same gender so they can share twin-bedded accommodations. Although we’ll do our best to fulfill your request, if we can’t find a match, you’ll have to pay the single occupancy price. Items of a personal nature, laundry services, souvenirs, etc. An advance payment of $1,600 USD per person, along with the completed reservation form, are required to secure your reservation. After June 5, 2018, initial payment will be $3,000 per person. A second payment in the amount of $1,400 USD per person is due by June 5, 2018. Final payment is due by March 22, 2019. Cancellations must be in writing, by email, fax or letter. All advance payments, less a $600 USD per person service fee, are refundable until July 5, 2018. From July 6 to December 5, 2018, all advance payments, less a $1,800 USD per person service fee, are refundable. There are no refunds after December 5, 2018.